The director of The Macbeths, Dominic Hill, is not new to adapting the famous play. Having directed the play in the past, including an operatic version, Hill now turns his attention to one of its central themes, focusing on its most compelling relationship, that between Macbeth and Lady Macbeth. The Macbeths is a concentrated dose of conjugal psychology and, how that infamous regicide sends the characters spiralling into dark places without redemption. The Macbeths is short in its runtime (clocking in at 70 minutes), sparse in its cast list, consisting of only the two protagonists, and a small set. The first thing we notice is that Macbeth and Lady Macbeth are both portrayed by women. While this decision is also freighted with gender and sexual politics, ultimately, Hill’s decision suggests that gender identity is not his central focus. What matters here is two people in love, grappling with their situation and how it affects their relationship. Having taken to run with this decision, there remains some inconsistencies in how Lady Macbeth addresses Macbeth. Sometimes Lady Macbeth addresses Macbeth by male pronouns and calls him “king” or “lord” and at other times Macbeth is referred to as “lady”. Whether this was a conscious decision or an error is unclear. Perhaps the intention is to keep these pronouns fluid as a way of demonstrating the irrelevance of gender/sexual identity in this adaptation. The play begins with Macbeth telling Lady Macbeth about their encounter with the three witches and their prophecies. It then continues, as we know it, with the murder of Duncan and his chamberlains. After this, the play diverges from the original as we witness the disintegration of the Macbeths’ relationship. Both characters take turns to convince, manipulate each other in a bout of psychological sparing. These moments are made gripping by the actors’ energetic and often terrifying performances. In his online introduction to the play, Hill explains that exploring the psyche is also at the core of his adaptation, and this is indeed his play’s strongest feature. The Macbeths makes a point of having the characters lose touch with reality; captivating use of dream sequences, the supernatural, the characters drinking alcohol, and sound design all build up context accumulatively. As the play goes on, both characters become increasingly unhinged and, as an audience member, it becomes difficult to discern the real from the imagined. Yet although such a blurring contributes to the play’s power, it also becomes difficult to follow towards the end. Performed in the theatrical round with seating set around a very bare set, makes for a more intimate and intense experience. The set seems simple – a bed with white sheets in the middle of the floor above which two strips of fluorescent lights hang – but it is enlivened with inventive use of lighting and sound , with its use of props, especially the eye-catching visual drama of red blood on white sheets A limited and more minimalist approach to the set like this can often result in more imaginative approach, but while the use of a limited set is here inventive enough, the staging choices in The Macbeths is, to my mind, problematic. 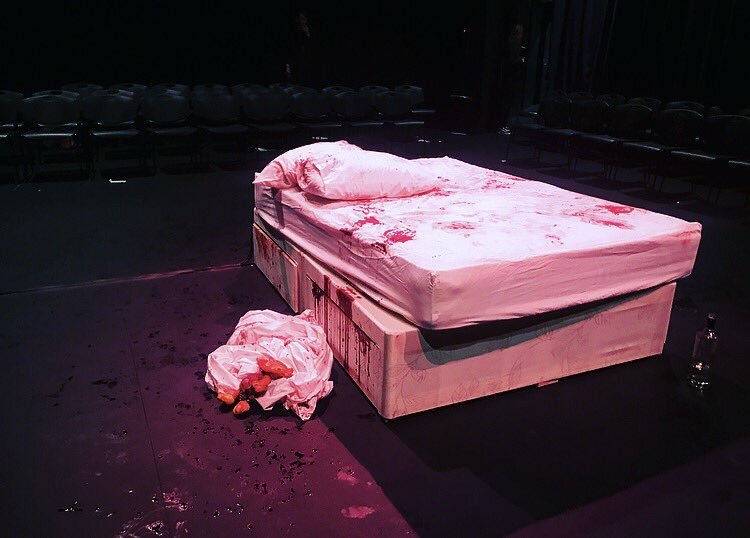 At various points in the performance, Macbeth and Lady Macbeth sit on the ground at opposite sides of the bed. And their backs are turned to some of the audience. This makes it difficult to see some of the smaller actions being carried out and, most importantly, to hear some of the play’s most famous monologues – including the “unsex me here” speech. The Macbeths takes one slice of Shakespeare’s original and inspects it, poking and prodding it and then taking it to darker depths. By stripping the original Shakespearean drama back to a bare minimum and throwing in great acting talent, Hill’s adaptation proves to be an engrossing experience which gives audiences plenty to ponder.